Rochester Shire (1909-94) was proclaimed on 27 October 1909, as the successor to the Echuca shire. The latter shire was formed in 1871, extending from Mount Hope in the west to Yarrawonga in the east. Between 1878 and 1884 the easterly and central parts were severed, leaving a shire which was renamed Rochester in 1909. (Echuca borough was a separate municipality for the whole time). The shire’s administrative centre was Rochester on the Campaspe River in the eastern part of the shire. Beginning as a predominantly flat, dry farming area, it became a substantial irrigation district when the Waranga Western Channel was extended across the Campaspe River in a westerly direction 1909. The Rochester Irrigation District extended to Ballendella, Bamawm, Gunbower, Lockington, Nanneella and Tennyson. The additional farm population amounted to a tenfold increase where dry farming was replaced by dairying, lucerne crops and orchards/vegetables. The government constructed 65% of the homesteads, and farms were provided with cash advances and livestock in some cases. Poor drainage caused orchards to be replaced by dairying during the 1920s. 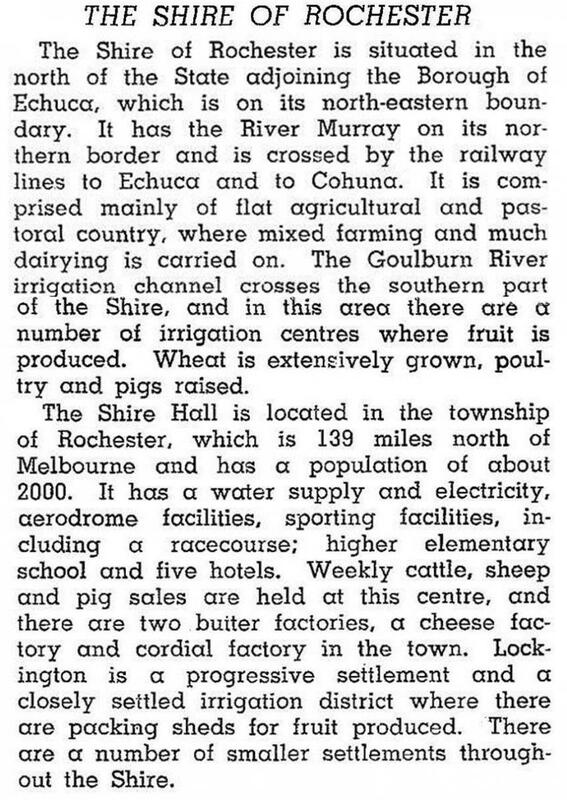 The main transport corridors through the shire were the railway and Northern Highway via Rochester to Echuca, the railway to Cohuna via Lockington (1915-1980s) and the Murray Valley Highway along which are Torrumbarry and Patho. In 1994 about 75% of the shire’s area of 193,425 hectares was farmland carrying 34,800 meat cattle, 74,000 dairy cattle and 115,000 sheep and lambs. Twelve thousand hectares were used for cereal growing. On 18 November 1994, most of Rochester shire was united with Echuca city, Deakin shire, Kyabram town, most of Waranga shire and part of Rodney shire to form Campaspe shire.